Most of us have seen the movie, but only a few of us have read the book, which is about groups of different minorities who despise each other because of their backgrounds. Slowly these "at risk" students are taught by a new, young teacher named Erin Gruwell how to get along with each other and pursue a higher education. The book is very much like the movie, but I believe everyone should read this wonderful book that was written by Erin and the actual students depicted in the movie. 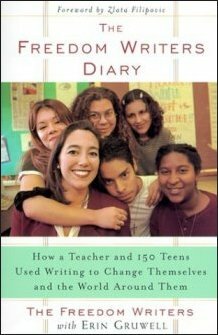 Freedom Writers includes insights into their life stories and their problems. The book was amazing. It impacted me in a very strong way. It showed me that things could always be worse, and if those students survived and were able to accomplish so much more than people imagined for them, then I could achieve anything if I just try hard enough.